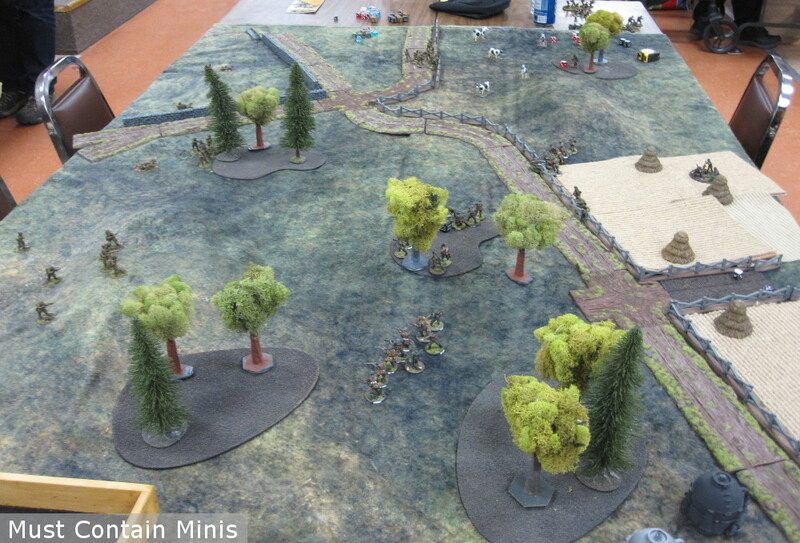 Some time ago, my friend, Dave Lamers, asked me to help run a Demo game of Bolt Action at an event on behalf of Crucible Crush. Not knowing entirely what to expect, I went to help him out. 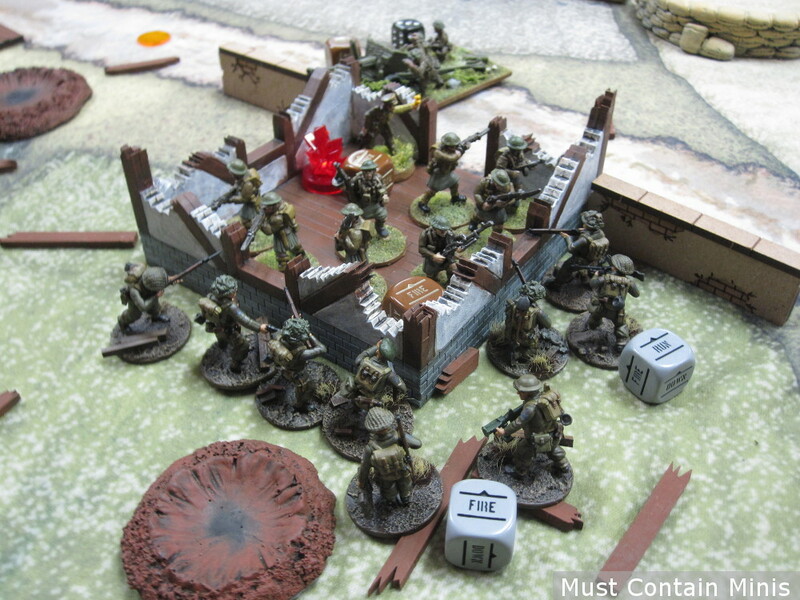 With me, I brought one army, some terrain and a Cigar Box Battle Mat. 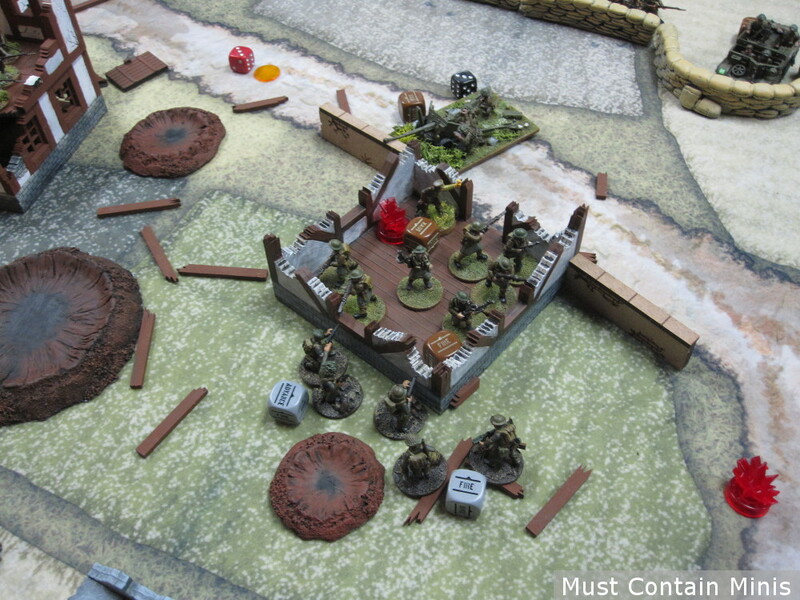 Dave brought two armies, another Cigar Box Battle Mat and enough terrain to do a couple of tables. When we arrived, Dave and I went to work setting up two demo tables. 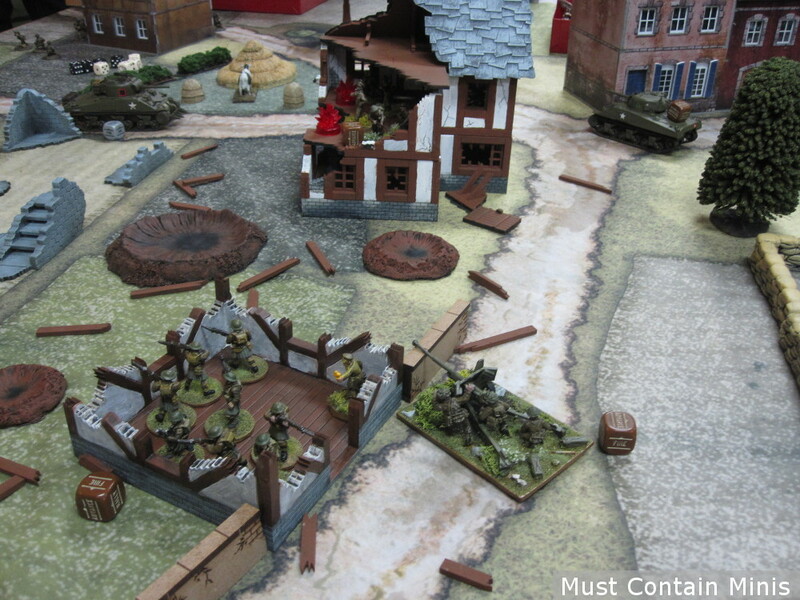 A total of seven new players showed to give Bolt Action a try. Dave took four of them to his table and I took three to mine. 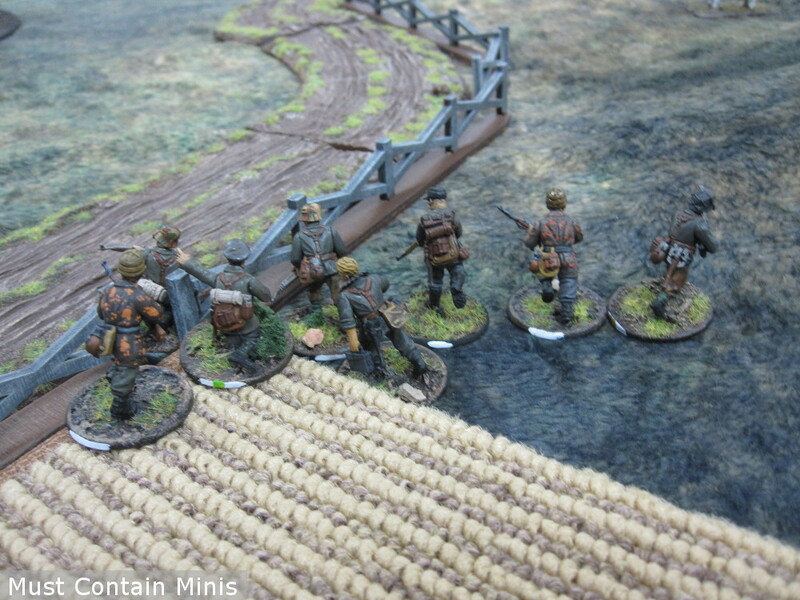 Dave ran a scenario from Bolt Action’s Market Garden book. Below is a look at the table. He has a few forested areas, some fields and even some cows! To keep things in order, he also brought along a dice tray. The mission he played was the one from Market Garden where American Paratroopers have to roll out colored panels, beacons and set up Eureka Radars to help the next round of jumpers. 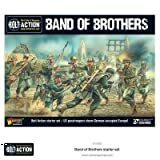 The American Paratroopers in this mission are rated as Veteran while the German defenders are all inexperienced. Dave Lamer’s Market Garden Table. 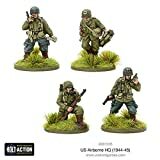 American Paratroopers vs an inexperienced German SS training battalion. 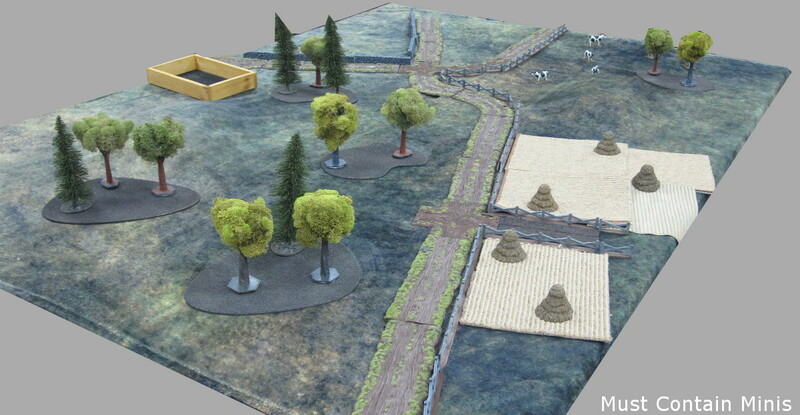 The goal for the Americans in this mission was to rush the center of the board and spend a few turns deploying reflective panels to help guide additional Paratroopers. The Game in progress. 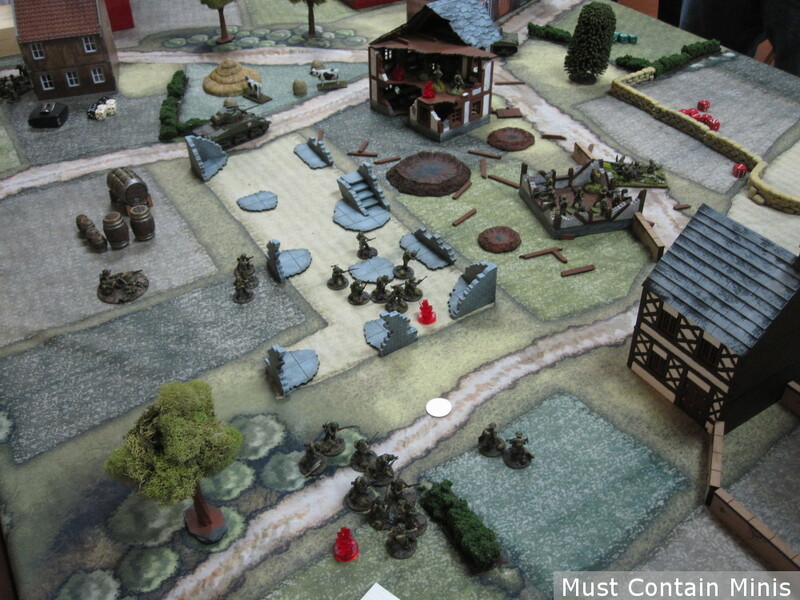 You can see the Americans on the left and top of the table rushing in on the German defenders. If I remember right, Market Garden allows infinite range for LMGs and Rifles in this mission. Regardless, the Americans have their work cut out for them. 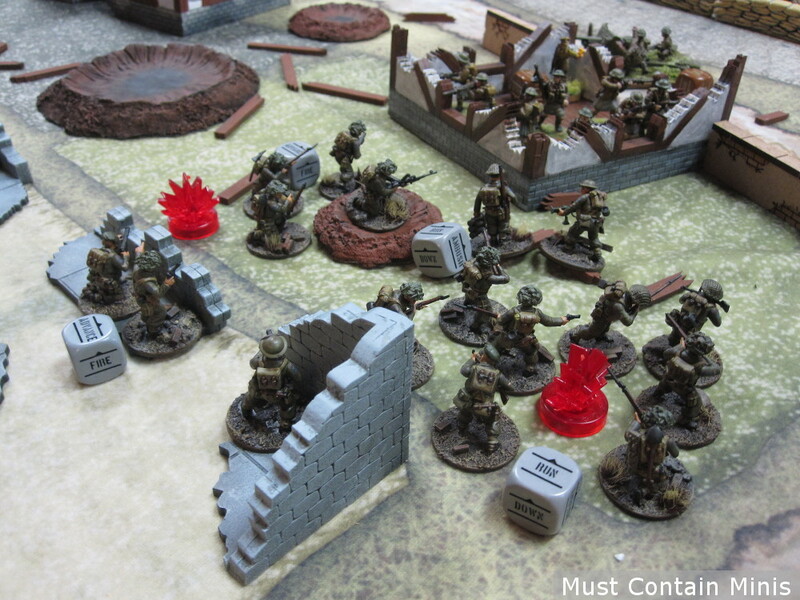 The Germans fight back hard sending many inexperienced troops into the battle. Some German soldiers pushing back the advancing Americans. In the end, it was the Americans that won this game. Over at the other table, a different battle raged. Over at my table, we had a red-on-red battle going. In essence, this was a training mission. Perhaps the two British forces used paint balls for ammunition. As for a mission, I just rolled one out of the core rule book with the players at the table. 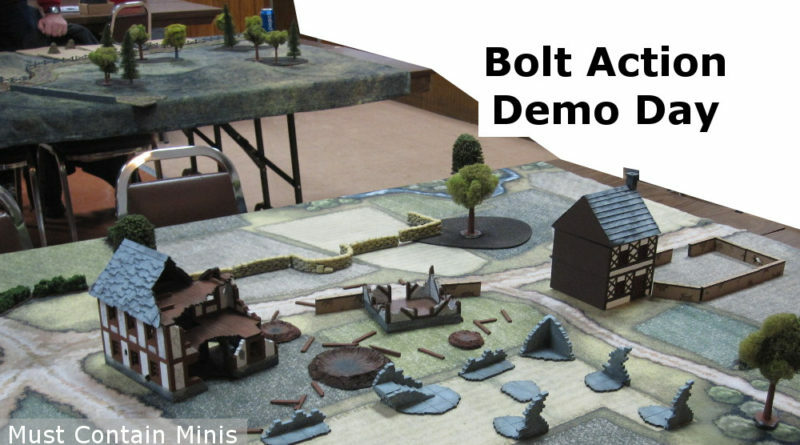 My Demo table for Bolt Action was a little different. Instead of running a Campaign Scenario, I had the players roll for a mission from the core rule book. We rolled Manhunt. In Manhunt, the Defender must set up to half their force in a one-foot radius from the middle of the table. In those units, is the player’s highest ranking Captain (whom the attacker is trying to capture). 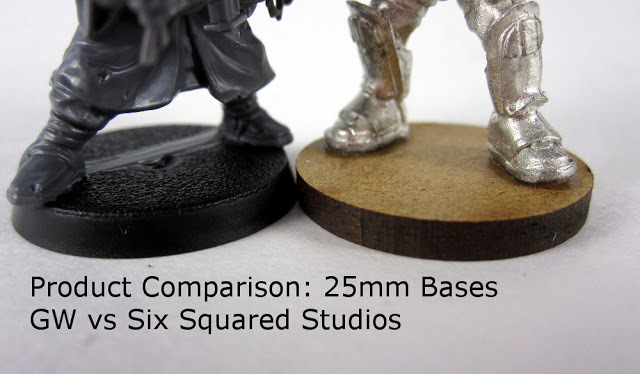 The rest of their units come on the table in later turns. The attacker must bring half their force on the table during the first wave. More reinforcements come on in subsequent turns. 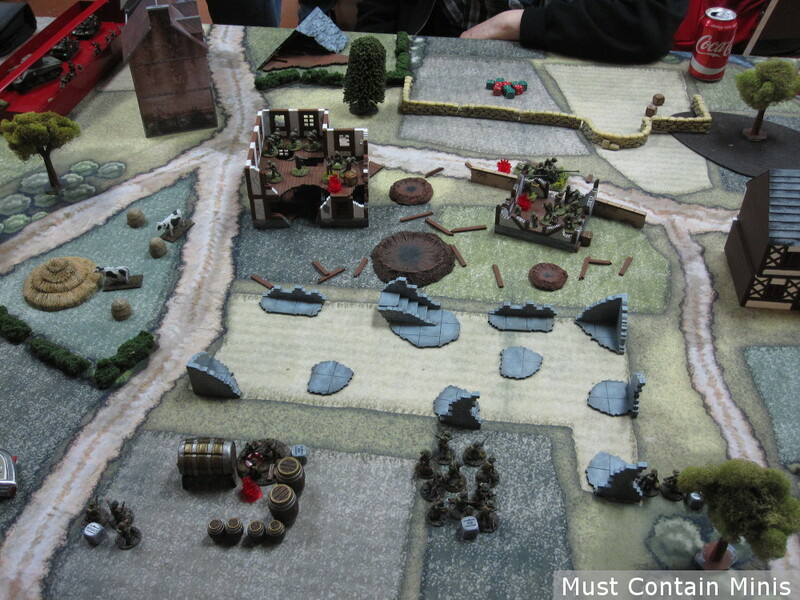 Below are pictures of the two armies at my table. One is a Regular ranked Canadian force and the other is a Veteran British force. 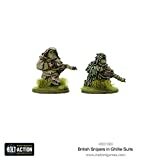 We used all of the rules found in the core rule book, and none of the extra nationality rules in the British Army Book. The Canadian Battle Group ranked as Regular. This army was provided by my friend Bill. I was very happy that he brought this army as otherwise we wouldn’t have had enough figures to play a 1000 point game. In the mix, Bill has a Sherman V, PIAT and 6-Pounder Gun. A force well suited to take on an abundance of armour. 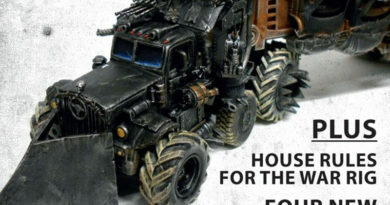 The force I supplied is one with an abundance of armour – mostly in the form of transports. 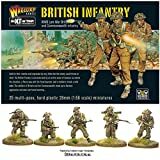 This British force ranked as a Veteran force. With three players at the table, we split one army in half for two players and gave the other army to the third player. This made the game two on one, but it was fair in points. My key goal was to introduce players to the game and get them interested in the system. The British player would be the defender in this mission. 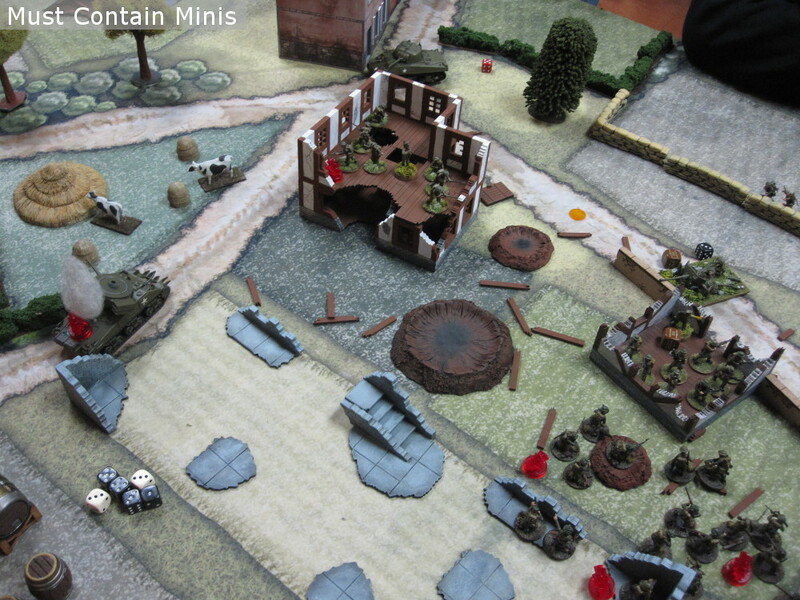 The Terrain was set up before the mission was even rolled. 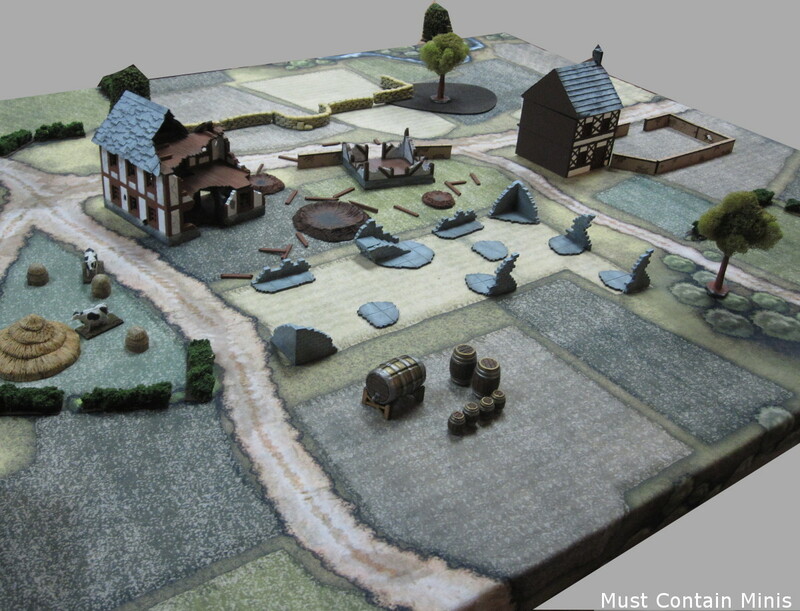 The British set up their leader and some elite soldiers in the Cottage Ruins by the 6-Pounder. They then placed their spotter and another squad on the top floor of the ruins near-by. The 6-Pounder cuts off one of the roads deterring tanks from entering the field from a certain direction. At the end of the first turn, this is how the board looked. Rather than encircling the British Force, the Canadians decided to have all of their strength come on the table from the same side. As I ran a demo rather than concentrating on writing a Battle Report, this post will feature just the highlights of the game. My main goal here was to get other people interested in the game and I achieved that objective. 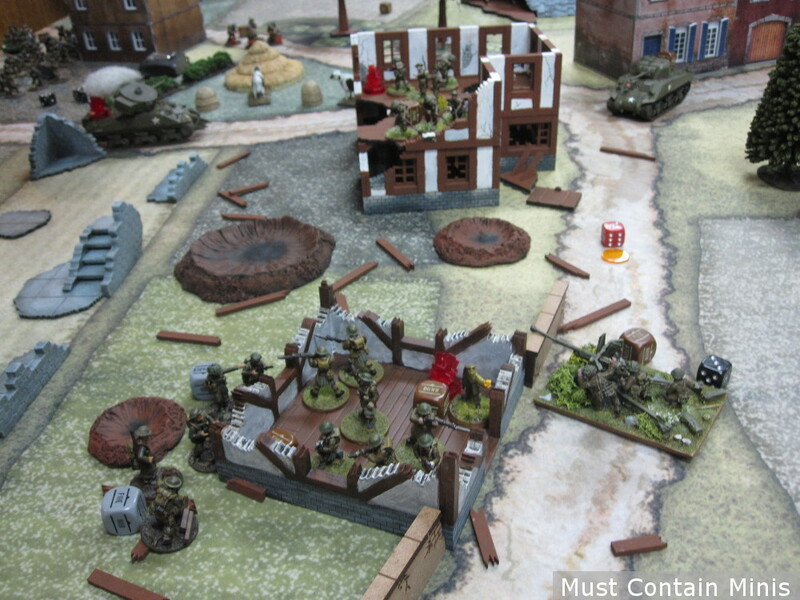 A Couple of tanks enter the board. The Canadian one is on the left. The 6-Pounder rotates to engage but can’t fire this turn. The British call in a Bombardment with their Forward Observer against the advancing Canadian Forces. Unfortunately for the British, this artillery strike is delayed. 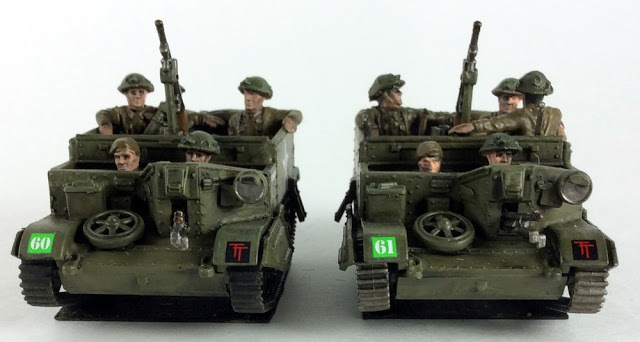 The Canadians press forward and the British bring in their mobile troops in a Universal Carrier. 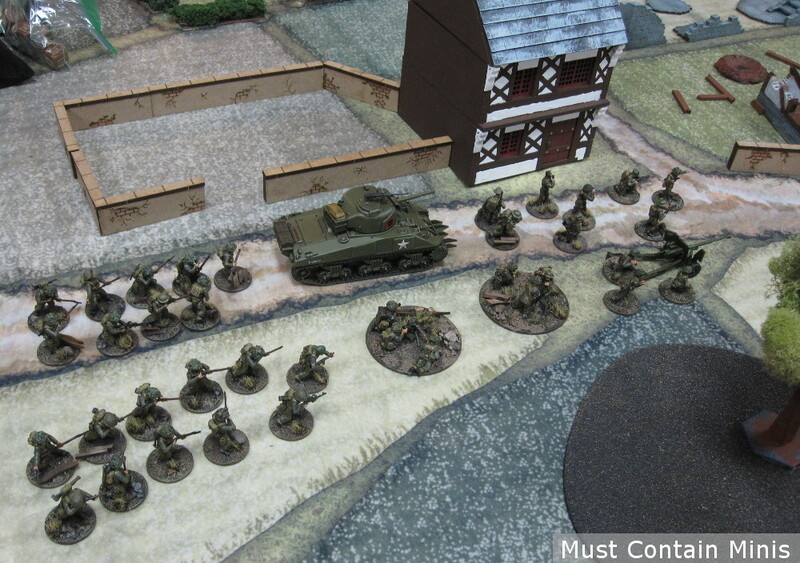 The British tank on the right is trying to eliminate the Canadian Forward Observer outside the frame of this photo. That observer has not yet called in his strike. The British troops disembark from the universal carrier to provide a second layer of defenders should their Commander have to run. The Canadians run forward knowing that there is a big gun potentially ranged in on their position (that coin represents a bombardment marker). 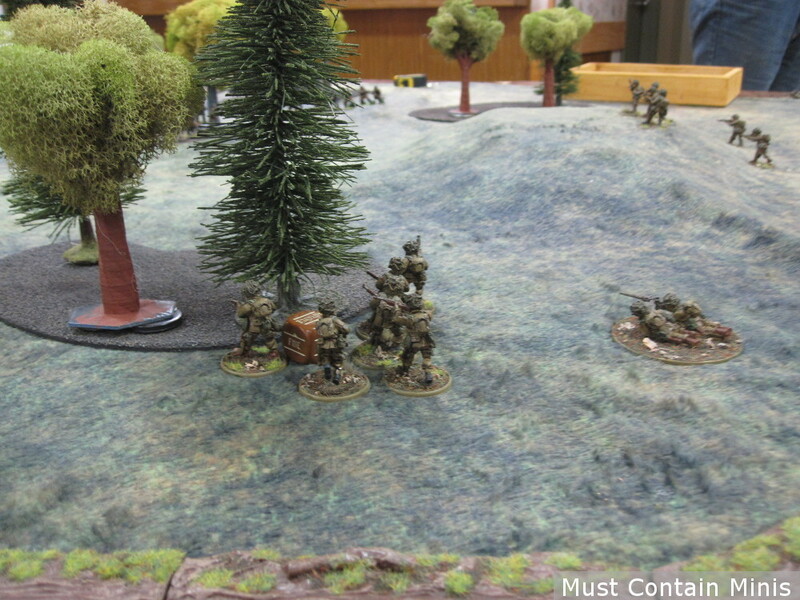 The Canadians charge in on their objective. All they have to do is capture the Commander to win. 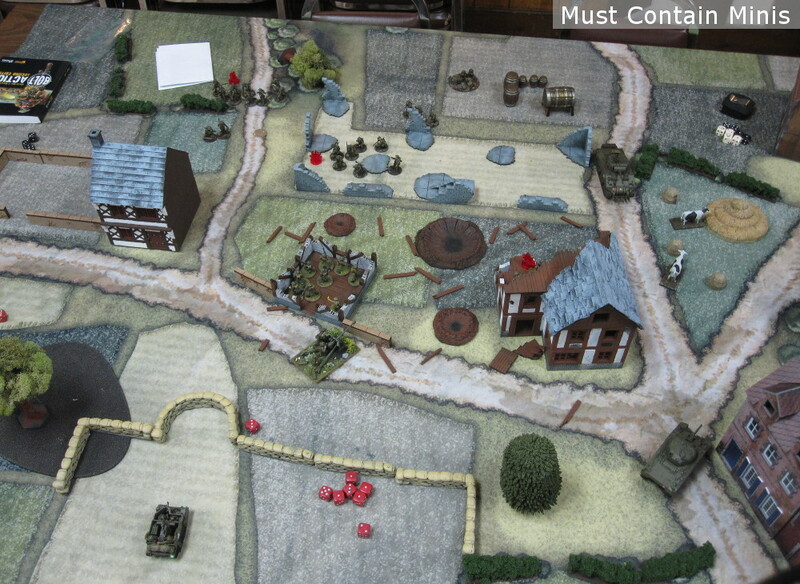 At the start of the next turn, the British take out the Canadian Tank using the 6-Pounder gun. The British Sherman also took a shot at the Canadian tank but missed. The Canadians charge in on the ruined cottage. 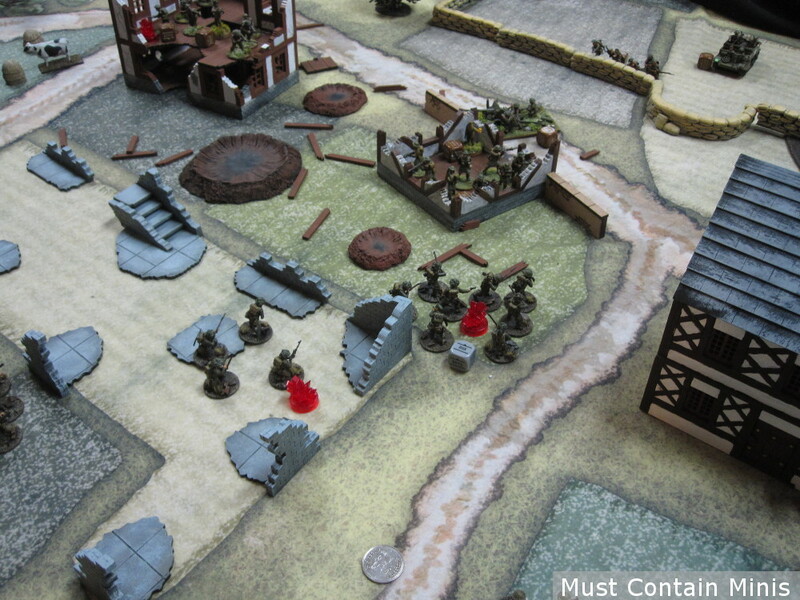 The Captain’s defenders hold their own, but the Canadians are close to their objective. The man with the glowing cross is the British Commander. The Canadian Attackers get mowed down. This is the scene at the end of the game. 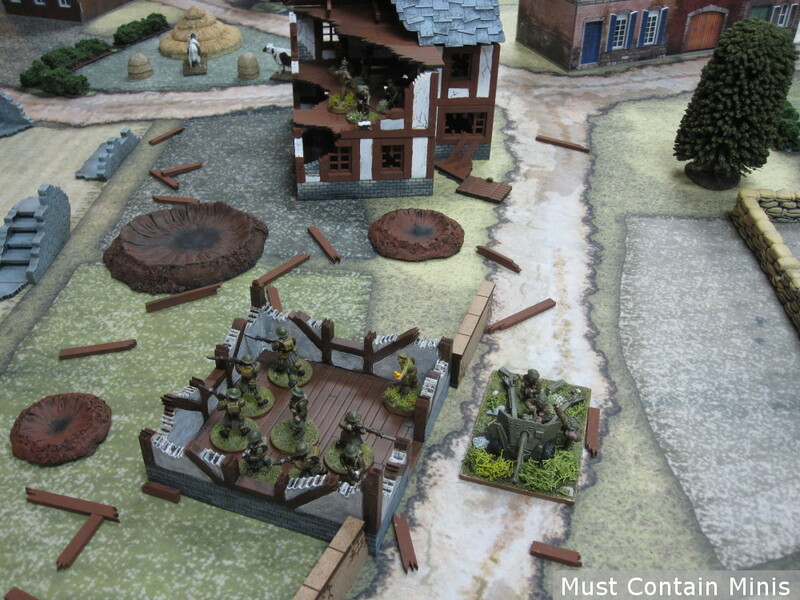 The Canadians take heavy loses and fail to capture the commander. At this time, the Canadians resort to trying to kill the commander, through shooting, to change the game into a draw, but it did not work. The British Commander lives to fight another day. The yellow token is a Canadian Bombardment that failed to come in before the end of the game. Overall, the participants of this game all had a great game. I also had a great time teaching people the game. It is something I really enjoy doing. The British won, but the Canadians still enjoyed the game. These players will likely play again. Thanks goes out to everyone that participated and to Crucible Crush and Dave Lamers for inviting me.